How much does the Texas Concealed Carry Ed Course cost? The Texas Concealed Carry Ed Course fee is $49.95. A handgun safety course is required for each person who wishes to apply for the Texas License to Carry. Typically it takes about 4 hours to go through the online course, excluding any quizzes and/or exams and re-studying that you may choose to do. There is no minimum age requirement to take this online course, but you need to be 21 years or older when you submit your LTC application. Do I have to be a resident to take the Texas Concealed Carry Ed Course? Is the Texas Concealed Carry Ed Course approved by the Texas Department of Public Safety? The Texas Concealed Carry Ed Course is approved and accepted by the Texas Department of Public Safety. The Final Exam is the exam you take at the end of the online course. You must score at least 80% on the Final Exam to pass. You have 3 attempts to pass the Final Exam. If you do not pass the exam in the 3 attempts given, you will be required to repeat the entire course. If you don’t complete the exam in one session, don’t worry. When you log in later, you will be taken to the first unanswered question of the exam. How do I get my License to Carry? 2. Take the in-person proficiency test. To finish the education requirements for your Texas License to Carry, you must attend and complete a handgun proficiency test. 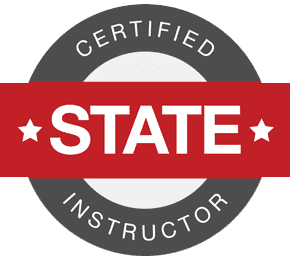 A list of certified handgun instructors is available at: Texas Department of Public Safety and U.S. Law Shield. 3. Apply for your License to Carry. After passing the handgun proficiency test, you can apply for your License to Carry. Once you pay for and pass the online course, you will be able to immediately print out the LTC-101. This is your proof of online course completion. You can print the LTC-101 right then and/or request that a PDF be emailed to you. What is the permanent License to Carry? The License to Carry is proof that you have met all the requirements to legally carry a concealed handgun in Texas. How do I replace my License to Carry if I’ve lost it or it has been damaged? To replace a lost or destroyed License to Carry, contact the authority who issued your original permit.